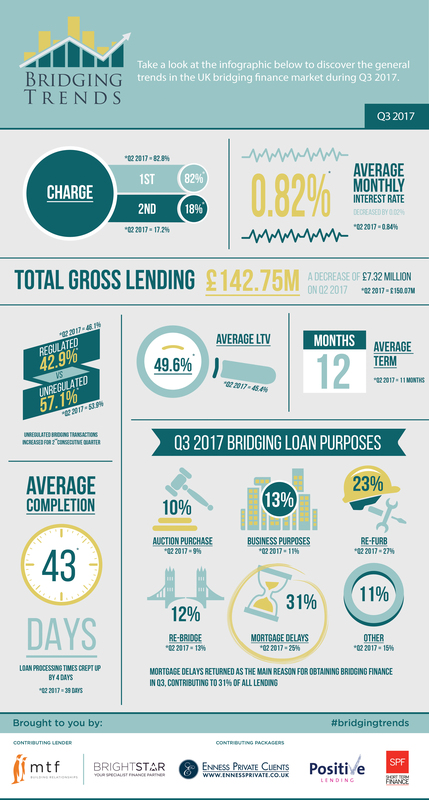 Take a look at the infographic below to see the trends that shaped the bridging finance market in the third quarter of 2017. “I think when you keep in mind the fact that this was over the summer holiday, a drop of only about 5% in lending volumes compared to the last quarter is actually quite impressive. “I was surprised the average interest rate hadn’t fallen further than it has. We have seen pricing under quite a bit of downward pressure as certain lenders fight to increase market share and protect what they already have from new entrants. “I noticed an increase in transactional activity at Positive Lending in this quarter – quite significantly so. What was evident, and this report suggests the same, is that the larger loan transactions have reduced during the period.